Anyone Got $250,000,000 for a House? Did Rihanna Nab a New Nest? DESCRIPTION: Celebrity owned 1933 East Coast Traditional, beautifully set on private, gated half acre. Suburb original detail, French doors throughout provide glorious light and views of surrounding gardens. Kitchen w/ granite counters, Sub Zero, Viking appliances. 2 WBFP, central air. cond, sun room, sep. breakfast room, Liv. rm w/ exposed beam ceiling. Flowing layout includes 3 beds, 2.5 baths in main house, plus guest unit with bath. YOUR MAMAS NOTES: Last night, while we worked our way through our soothing pre-bedtime g&t and waited for the sleeping aid to kick in, Your Mama perused the newest listings in LaLa Land when we stumbled upon a house in the Hollywood Hills being marketed as a "celebrity owned" home. Although a delicious serenity only booze and pharmaceuticals can bring on had settled our usually frazzled nerves, our eyes dilated with excitement. Okay, well, maybe they dilated because of the pills. Whatever the case, we did what we always do when we get a whiff of a property owned by famous folks, we calmly and cooly sifted through the property records in order to find out just who the celebrity owner is. But alas, the property records were not quite as clear which meant waiting until morning to begin dialing up our spider web of well connected sources and informants in order to solve the property record puzzle. 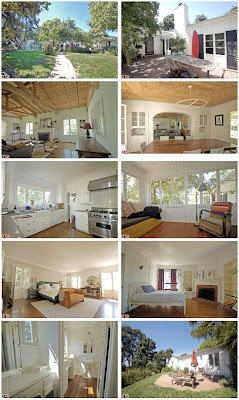 In the meantime, we kept looking at the listing photos which were oddly and painfully familiar. For some reason, which at first we thought might have been the gin and sleeping pill, the house tripped all the few memory wires we have left. Morning finally came and before we could even make a second inquiry the nearly omniscient Lucy Spillerguts sent word that the Bennett Drive domicile, listed at $1,685,000, is owned by none other than actor Mark Ruffalo and his pretty but absurdly named actress wifey Sunrise Coigney. A stage actor turned indie film favorite, Mister Ruffalo has recently appeared in silver screen specials like Eternal Sunshine of the Spotless Mind, All the King's Men, Reservation Road–which was a better book than a movie we don't care what anyone says, and The Brothers Bloom with Oscar winners Rachel Weisz and Adrien Brody. From the looks of things, Mister Ruffalo will be busy as a beaver the next couple of years with seven, count 'em, seven films in the hopper and in post- and pre-production. Despite his professional success, which includes a Tony nomination in 2006 for his role in the dramatic play Awake and Sing!, Mister Ruffalo has oft been visited by misfortune and tragedy. In 2002 he underwent brain surgery to remove a benign tumor which left him partially paralyzed and from which he's since recovered fully. In early 2008 he lost good friend Heath Ledger to a drug overdose and in late 2008 his hairdresser brother Scott was found dead of a gunshot wound outside his Beverly Hills residence. Anyhoo, property records show the down to earth seeming Mister and Missus Ruffalo scooped up their 2,957 square foot house in October of 2004 for an undisclosed amount of money. If Your Mama was forced by the Gestapo to make a guess and based on information found in the property records we'd postulate they paid more than $1,600,000 and less than $1,800,000. But children, again, that is just a guess from someone who doesn't know a tractor from flip flop, so do not go running around quoting that number trying to act like a damn know it all. A long walk from the gated driveway across a not exactly well kept lawn leads to a pleasantly tree shaded courtyard and the front door where for some inexplicable reason Mister Ruffalo (or the stager ladee) leaned a red surf board up against the house. The white painted exterior seems to be clad in a casual and country-ish board and batten siding that although not terrible is, as far as Your Mama is concerned, usually better left to barns and sheds and other farm structures. The living room has been pared down to it's bare essentials with little unnecessary frou-frou while retaining all of its original non-chalant charm. There are wood floors, a fireplace and a magnificent wood beamed ceiling that has been stripped of any paint giving it a rustic yet still contemporary aspect. Up a couple steps from the living room is the dining room with old-school built-in china cabinets and a magnificently minimal chandelier hanging from the raised and rustic, stripped wood ceiling. The cozy and comfortable kitchen contains white Shaker style cabinetry, a porcelain farmhouse sink, some sort of beige-looking granite counter tops that we don't like very much and a bevy of high grade appliances including a six burner Viking range. Although the listing for the Ruffalo residence only popped up on the internets yesterday, the 1st of September, it appears to already be in contract. Lucky Mister Ruffalo. Your Mama has no idea where Mister and Missus Ruffalo will be moving but considering they have a trio of tykes we will take the liberty of assuming they are wanting and headed towards a larger nest in which to raise their chicks. Where that is, we don't know so don't bother asking. What's with the hospital bed? The living room needs some drapes or something. Too bare and spare. Mama, like you, I loved seeing this house in Domino, when it looked like folks actually lived there. It's a pretty place and I'd be happy to shack up there with the five critters. Mama, please go easy on those gt's and pills. We don't want you to end up like so many of the people whose houses you so delightfully expose to our view. "We are positively dying over those two artworks over the bed in the master bedroom." Mama, please do go easy on the g&t's. Or send a few my way; I could use a beautiful apparition about now. Looks like a tear-down to me!! And what's with the lack of lawn maintenance? Whoever staged this home did a crap job. The Domino pictures did a complete 180 of the way I first viewed this home. They should have left it as is..although what do I know since this house is already in contract. Surprisingly, I sort of hate the wood ceiling and the batten board walls. Maybe I need more coffee or I need to see the place in person to get a better sense of it, but at the moment, those aspects of it really irritate me. Other than that, it seems fine for the price, size and location. Good for the sellers for going under contract so fast. I agree it looks like a tear down and the staging is absolutely horrific. I certainly hope this is not a reflection of the Ruffalo clan's taste! It would shatter my entire image of Mark the Pensive. Not a huge fan of wood ceilings in general, but I like this house. Domino's pics are great. did mama forget to put the tonic in her pitcher of G & Ts ? Staged? More like stripped...and a red surfboard? Talk about contrived. Puhleeze. The bedroom with the iron bed looks like something in a sanitarium and the glass room looks like the visiting room. It's all so depressing. I say knock it down and start over. I miss Domino magazine. I was very sad when it closed, and I've tried to fill the void with House Beautiful or Elle Decor, but they are not the same. Mama, can you use your powers to bring back Domino? I like it because it was obtainable style. Mama was referencing the beautiful master bedroom artwork featured in the Domino Magazine pictures, available on Casa Sugar. She was kind enough to provide a direct link for the children. Hey, maybe it isn't staged at all. I hear it was sold before it hit the market. Mama, maybe some of your readers need to share some of your gt.s and pills. As to the staging, I'm sure anything which we would expect would not suit Mark's tastes is just that, and that the previously published photos were of the Ruffalos' own furnishings. Those have probably already been moved out, because they have already found their new nest, and what is shown here is just so as not to show empty rooms in the official listing. As a fan, I wish Mark and his family great joy in their new digs, wherever they are! Well, some rooms of the house look absolutely fabulous. Some of them are, however, pretty bad. It kinda seems like the rooms are from different houses.